Fending off despair about the state of the world can be a full-time job these days. One scroll through your social media accounts or a five-minute session watching the evening news can bring disturbing stories of crises unfolding all over the world. There is barely time to take a breath between catastrophes--from the Ebola outbreak in West Africa to the recent flooding in Louisiana, to the refugee crisis across Europe, conflict and disaster have plunged an unprecedented number of people into situations where they must endure unthinkable suffering. Within each emergency, there are helpers doing everything they can to improve conditions and ensure access to basic human necessities like shelter, food, and medical care. But as the need for humanitarian aid grows, how can efforts to alleviate human suffering evolve with it? This is a question the Harvard Humanitarian Initiative seeks to answer in an upcoming online course starting August 30, free to everyone through the HarvardX platform. According to the course description, Humanitarian Response to Conflict and Disaster will prepare us to recognize and analyze emerging challenges in the humanitarian field and explore the ethics and principles that guide humanitarian response. I am grateful to the course creators, Dr. Michael VanRooyen, Director of the Harvard Humanitarian Initiative, and Dr. Jennifer Leaning, Director of the FXB Center for Health & Human Rights at the Harvard T.H. Chan School of Public Heath, for answering a few questions about their course, which currently has 12,000 registrants from 178 countries and counting. Why might we want to take this course? You would want to take this course if you have a professional, personal, or academic interest in first-hand accounts about what creates success and failure during humanitarian responses. It's pretty unusual for humanitarian staff to be able to speak frankly about the challenges they face personally and professionally within the field, and this global platform based at Harvard has given us a neutral space where we can interview and talk about things that just don't really get addressed during rapid response operations or within response organizations due to industry taboo. The participants will also become connected with over 12,000 other global learners at all levels of the humanitarian enterprise through an open discussion forum approach, which is integral to the course. How are the topics you will cover relevant to the world today? There really can't be any question that the challenge of 65 million displaced people globally will fall on the humanitarian community more than any other. As a sector we don't have the type of training, education, or research we need to grapple with these challenges. Education is our best possible solution for improving the responses we engage in while preparing the next generation with best practices before they adopt outdated or ineffective approaches to the daunting challenges they face. In the field, most of this education is purely vocational, informal, and mentor-based. There are only a handful of free opportunities for anyone engaged in humanitarian work to learn from peers in other organizations about what works, what doesn't, and common mistakes to avoid. What can registrants expect to learn? Registrants should expect to learn about the range of activities humanitarians engage in with equal intensity. They will explore the theory and practice of humanitarian work and where it breaks down in the field. They'll learn how to work with or choose not to work with partners, including the military. They will explore the relationship between development and emergency response, essential historical cases, and how the industry has changed in the last 30 years. We will also offer advice to humanitarians concerning their security, risk, mental health, working with confidential information, professionalization, refugee/IDP camp protocols, among other critical issues that come up in the field. With so many of us concerned about the refugee crisis unfolding in Europe and elsewhere around the world, how will this course prepare us to take meaningful action? We have principles to guide us as humanitarians, but they fall short in the field. This course helps us to reevaluate as a community how we can apply the principles of humanity, impartiality, independence, and neutrality to the emergent crises we face in a way that effectively evolves and guides action rather than acting as signposts we pass on our way to fieldwork. 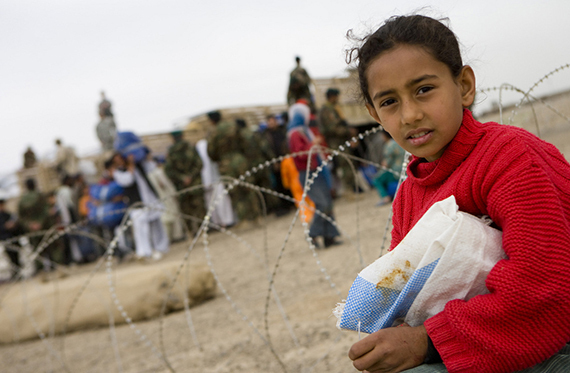 "Humanitarian Response to Conflict and Disaster" is a free online course that begins on August 30, 2016. To register, visit the edX website. To learn more about the Harvard Humanitarian Initiative, click here. Marcy Franck shines a spotlight on ordinary people working tirelessly to help refugees and provides practical ways for you to help, too. Find her on Facebook, where she posts stories of hope from those who are there to help.